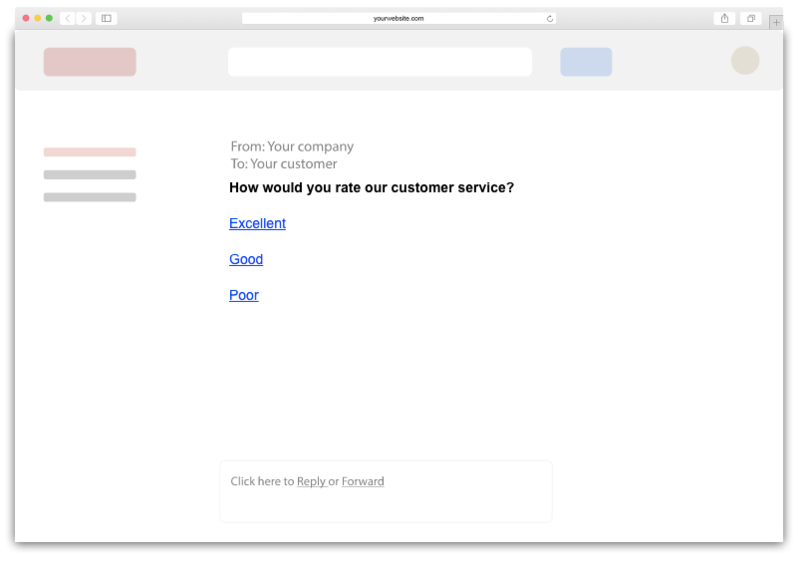 Creating a mail or message distributed survey with Survicate. You can use link surveys for various purposes, distribute them by email (manual or with Salesforce®, MailChimp, HubSpot and other marketing automation platforms) or messaging apps like Intercom. How does the link survey work? You can distribute link surveys by embedding the first question inside your email or sharing the link. Links inside an email are software- aware, so we can easily associate the response to a respondent. After clicking a link respondent will be redirected to the landing page with follow-up questions. ❗️Structure of an email doesn't allow you to embed more than one question inside a message.. Using link surveys allows you to segment your clients more easily, implement surveys as a part of your mail campaigns, measure customer satisfaction after they receive your products, etc. Why should I use these surveys? How to create the mail survey? And create a survey, applying logic and customising landing page. In the Share section, you can get the code snippet to add to your mail. We strongly advise you to check our section with tutorials on how to send mail surveys with different softwares. ✅ It works the same way either with a single answer on NPS question! Feel free to customise your email, you can add the welcome message, photos, et cetera. All the information is contained in links, so you don't need to worry as long as you don't make a mess inside the links.